Having enjoyed time in the L-29 I can safely say that “low cost” and “jet aircraft” really don’t occur in the same sentence. This is even truer when developing a Personal Jet. While there is argument on the definition, some have termed the more recent VLJ (Very Light Jet), as one with a gross weight under 10,000 pounds. A Personal Jet has a gross weight under 5,500 lb, which is substantially smaller. The L-29, a war bird, isn’t really either one but since it’s less than 12,000# , doesn’t require a type rating. Many start the design process searching for a low cost solution. The engine out of an L-29 is relatively inexpensive, assuming you can find one that you or anyone else would be willing to sit on top of. There is usually a good reason why the engine is cheap, thus the issue with finding parts, as well as someone qualified to work on it. Further, given the age of the technology, you can figure the thing needs an equivalent of a toilet bowl for a fuel delivery device (the whooshing sound is the fuel dollars being sucked down the drain). It makes the J-79 look efficient. Then, you need to determine what you want the airplane to do. If you don’t care about range and only wish to bore holes in the sky around your local airport, then you might develop a decent sized airplane, but you’ll never go cross country in it. The rule of thumb for any jet aircraft, in order for it to have anything approaching a realistic range, it must have as a very minimum the same amount of fuel on board in pounds as the engine is rated for static thrust, in pounds also. The L-29 flys only two hours in cruise but anything more strenuous makes it a much shorter flight. So, assuming you find a 1,200 pound thrust engine, (The L-29 Motorlet engine is 1,800 pounds of thrust) you will need to carry between 1,000 to 1,500 pounds of fuel. If you’re building a Personal Jet, then you may be lucky to achieve a thrust to weight ratio of .25 and while that’s OK, it’s not anything to brag about. A larger engine will require larger fuel tanks and a larger airframe as the design evolves into something ever larger. Then it weighs more and the engine that seemed plenty powerful isn’t so much. Small wonder there’s not too many of them around. The most recent personal jet effort was the ATG Javelin and it was a nice looking little F-18. Unfortunately they went bankrupt in 2008. If you want a short history, look here . None are in existence but it indicates why VLJ’s, with their range and capability, are more commercially viable. And those aren’t anywhere near what I’d call inexpensive. This entry was posted in Experimental, General Aviation, Technology. Bookmark the permalink. But hasn’t the fractional ownership/leasing provided by outfits like e-jet, etc., made the personal jet superfluous for all but the most well-healed?–And even THOSE types prefer the VLJ/e-jet mode for travel–as apposed to the L-29 type experience around the home drome. I agree there’s no market for a personal jet. It’s the domain of the hobbyist. 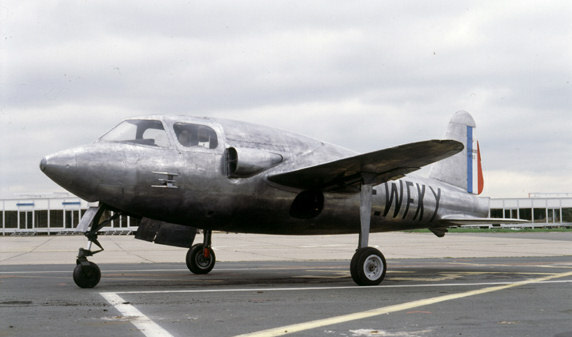 There was a single engine jet powered glider at Oshkosh which demonstrated that Williams makes truly small jet engines that can be used about anywhere. There’s also jet powered semi’s; pickups and outhouses. Fractional ownership puts small jet flying within reach of even the smallest companies and wealthier individuals but it’s still different than the VLJ. The folks that buy VLJ’s want to fly them and importantly want to own them as well. The other lesson learned the hard way by ATG Javelin is that you need to have a really good handle on the market for that sort of thing prior to pursuing certification. Of course the economy didn’t help. There’s a lot of companies invested in VLJ’s and many with down payments committed, so I think it’ll be big. Eclipse started it then Cirrus; Piper; Cessna; Diamond , Embraer and Honda all jumped on the bandwagon. I think the problem with VLJs is that once you get too small of an engine, you start to bump up against the weight of an occupant as a limiting factor. If I have 10,000lbs of thrust, adding an extra person does not make as big a hit in the thrust to weight as it would if there were only 500lbs of thrust. And that’s to say nothing about the issues with hot and high takeoffs. Don’t worry, I’m not a spoilsport…I want someone to build an efficient (relative) personal jet! Good point. The core issue is jet engines are not the most efficient ways to propel an aircraft. They’re the most reliable but propellor driven or even turboprop (turbines) are the better choice. But if you can afford a VLJ that never was an issue anyway was it?